As we journey through the season of Lent, we are spending time reflecting on the sacrifice made for us by our Lord and Savior Jesus Christ. He came into this world as perfect God and yet perfect man to take upon Himself the sins of all people. Through His death and resurrection, we experience peace that is beyond our own comprehension. On Worship Anew, it is this message of peace that comes through Christ Jesus our Lord that is so vital to be heard. Each week, thousands gather in their homes to hear God's Word preached in its purity on this program. Worship Anew is now on American Forces Network. Sharing God's message of peace every week with those who serve our country, often in dangerous circumstances for the sake of our freedom and liberties. Is there someone you know who is serving overseas and to whom you can recommend Worship Anew? And now, through Moments of Comfort, we are ministering to the hurting and suffering among us with the comforting message of God's peace that is for each of us. I hope you've been able to join us for these special devotional messages shared every Wednesday to draw you closer to the peace we have through Christ Jesus our Lord. We have managed so much through the support of our faithful friends who have given of their resources through which a bold proclamation of the Gospel is being taken to homes in your community and to all parts of the world. That is why I'm asking you today to consider a gift to support this vital undertaking of sharing God's Word through Worship Anew. With your gift, even more homes can be filled with the message of God's peace and more hearts will be comforted every week. In this issue of the Broadcaster, I encourage you to explore the April schedule for Worship Anew as we continue our journey through Lent and finally culminating with the joyous Easter message. On the next page, you'll be introduced to the theme for this month on Moments of Comfort, which is Peace. Larry Hencye has touched many lives with the message of God's Word over his 40+ years of service to the church. 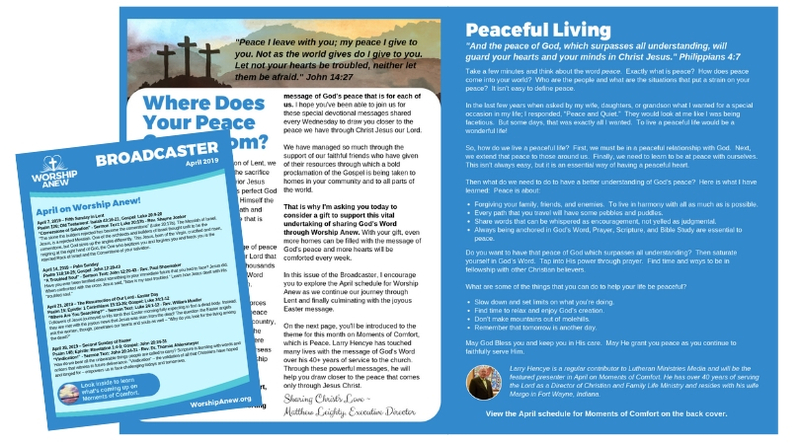 Through these powerful messages, he will help you draw closer to the peace that comes only through Jesus Christ.